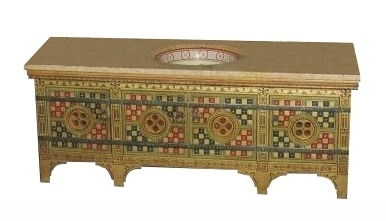 This piece ranks up there with Burges's best work; it is a stunning example of his style of painted Gothic furniture, but is actually by JS Chapel, Burges's assisistant of many years, who completed many works there on his death. 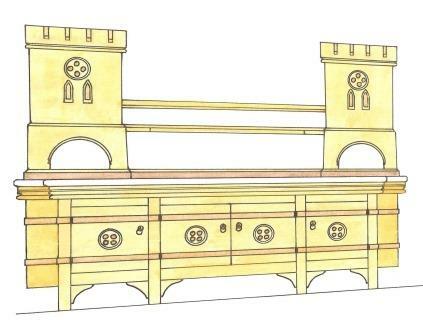 The washstand comes from Lady Bute's bedroom at Castell Coch, where it was fitted into a wall bay. It shows great imagination, being immediately Gothic yet a totally new piece, with little reference to past Gothic furniture. Originally the 2 towers held water tanks to feed the tap & basin!. 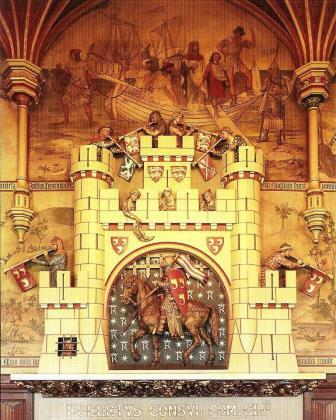 The towers design was probably influenced by the Banquet Hall chimney at Cardiff Castle, shown below right. The whole bedroom is a tour de force of new Gothic forms & decoration, in a recreated C13th French style castle. 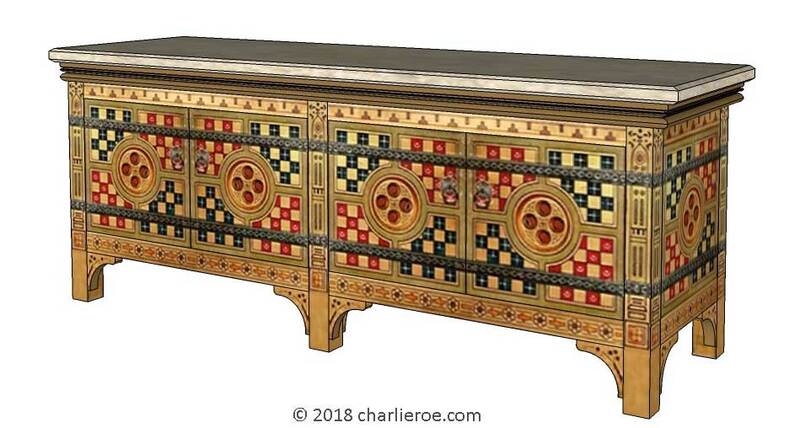 For all of the ornateness of the piece, it exhibits the best in Burges furniture, great shapes with ornate decoration on mainly flat surfaces to create a striking new design. While many today would consider such a piece too ornate & 'busy', the fundamental shape is quite simple, almost like Arts & Crafts work (which Burges was a big influence on). Also, people today are more likely to indulge in a little fantasy in their bathroom, which is a private room in the house. Having studied this piece extensively we could make an exact reproduction of it (we have the scale drawings for it), or something close to this style but smaller. The 2 versions above show how this can be adapted for smaller rooms (you could even have a 3 door version if you wanted). It doesn't even need to be a washstand; you could use it as a drinks cabinet, sideboard, home cinema centre (with flat TV above in the middle) are some possible ideas. Needless to say pieces like this are expensive but you will always be adding a Wow factor to a room with it. Shown above is a drawing of the washstand, for which we have the measurements. As a piece like this is made bespoke, you could have either an exact copy of the piece or change the size, colours, etc to whatever you want. 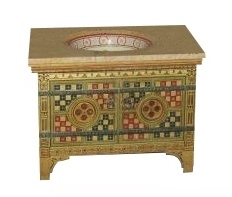 We have shown some alternate colour versions of this washstand below. Top left is a version shown in typical Burges red, used on much of his furniture. Top right shows a simple wood colour version. The bottom green version matches some of the green painted furniture used at Castell Coch, especially after Burges's death. The other 2 colours are bit more fantasy, certainly not Burges colours; but the kind of colours people like to use in their bathrooms these days.